Akshay Kumar demands 45 crore! 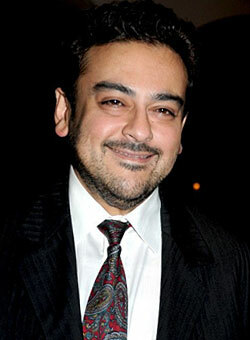 Adnan Sami Khan is a popular British-born singer musician, pianist, actor and composer of South Asian origin from Canada. His style merges Asian and Western styles and instrumentation and ranges from classical to jazz to modern pop-rock. Born, reared and educated in United Kingdom. His father Arshad Sami Khan was born in Pakistan and lived in India, was a Pakistani diplomat and had training in composing classical and jazz music. His mother belonged to an Indian Muslim family. Sami attended Rugby School. He went on to graduate from King's College London, throughout developing his musical style and technique on the Piano and thus evolving a new sound which he pioneered and ultimately introduced to the world thus becoming the first person to play Pakistani Classical music on the electric Piano. He had played piano since his childhood and so studied music in school and in college. Indian singing legend Asha Bhosle spotted talent in a ten-year-old Sami at an R D Burman concert in London, and encouraged him to take up music as a career. His most successful albums have been Kabhi To Nazar Milao (with Asha Bhosle) and Tera Chehra, and his music videos usually have had a host of Bollywood stars in them, including Namrata Shirodkar ("Bheegi Bheegi Raat"), Mahima Chaudhry, Raveena Tandon, Rani Mukherjee, Govinda, Fardeen Khan, Amisha Patel ("O Meri Jaan"), Bhoomika Chawla ("Maahiya"), Diya Mirza ("Pal Do Pal") and most famously, Amitabh Bachchan ("Kabhi Nahi") and in 2007 the soundtrack from the hit Salaam-e-Ishq. He has also sang couple of Kannada Film songs. His first such kannada song was a big hit " Don't worry madabeda" for the film " Super Star " starring Upendra. Recently he also sung for a film 'Soundarya" starring Ramesh. In 2006, he took a sabbatical, and reportedly lost over 70 kg, to make a come back in November 2007 as a host on a Hindi musical game show, Bol Baby Bol, on STAR One. His latest film music composition was for Shaurya (2008). Fight, kiss and make up! © Zoom Tv. All Rights Reserved.